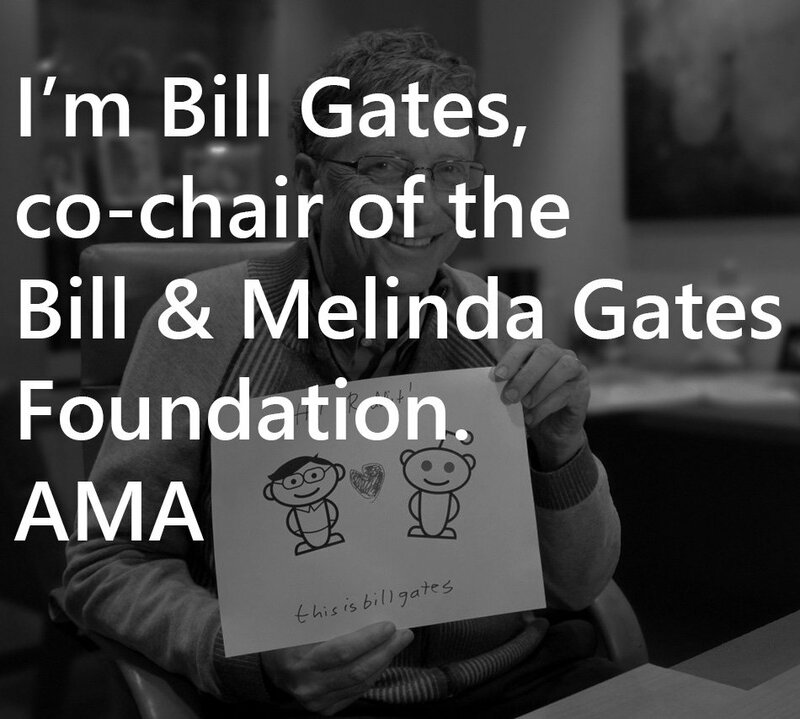 Bill Gates just wrapped up his first AMA on Reddit. In that little PSA post we did a few hours back, one commenter (who wasn’t familiar with Reddit) asked if we could grab the questions and answers. You know we’re a push overs for you guys, ask and you shall receive. Here are all the questions and answers from Bill himself. A quick note about the following before we jump in. You’ll get confused really fast if you read this like it was a typical interview between two people, mostly because it isn’t. An AMA is a collection of a bunch of questions asked by folks on the internet and answered by one person. There really isn’t any narrative or flow to the following, just Bill answering some questions. I’ll do my best to order it so that there is context where Bill does follow up any question to an answer. Bill Gates: There are two things this could reference. One is the free/pay for software mix. The Internet has benefited from having lots of free stuff and lots of commercial software. It has been interesting see people inventing hybrid models. Even stuff that is pretty commercial often has free versions for some audiences. Even the most open stuff often have services people choose to pay for. The second thing is the anonymous versus identified tension. This is another one where both will probably thrive since you want anonymity for some things and full identity for others. I am surprised how little progress has been made in the identity space but it will improve. Question: What do people give you for your birthday, given that you can buy anything you want? Bill Gates: Free software. Just kidding. Books actually. Question: Oh! What's your favorite book? Question: What one Microsoft program or product that was never fully developed or released do you wish had made it to market? Bill Gates: We had a rich database as the client/cloud store that was part of a Windows release that was before its time. This is an idea that will remerge since your cloud store will be rich with schema rather than just a bunch of files and the client will be a partial replica of it with rich schema understanding. Question: Possibly WinFS? I always wanted to see what happened to that. Question: Since becoming wealthy, what's the cheapest thing that gives you the most pleasure? Question: Where are you acquiring these cheap kids from? Question: How have other extremely wealthy people reacted to your excessively generous philanthropy? Question: I'm not Bill Gates, but he has made a huge positive influence. Many wealthy people I know point to Bill Gates as their idol. Not for his Microsoft days, but for his philanthropy. He also simultaneously killed many of my friend's hundred million dollar trust funds after their parents discovered that Bill was only leaving $10 million for his children. Bill Gates: I definitely think leaving kids massive amounts of money is not a favor to them. Warren Buffett was part of an article in Fortune talking about this in 1986 before I met him and it made me think about it and decide he was right. Some people disagree with this but Melinda and I feel good about it. Question: First of all: Thank you for all you've given and all you've done to make the world a better place. Given the recent targeting of health professionals in Pakistan and Nigeria, do you think eradication of polio is attainable in the next decade? How is the Gates Foundation going to get over this barrier to eradication? Also, what is your opinion on the anti-vaccination movement in general? Question: What type of computer are you using right now? 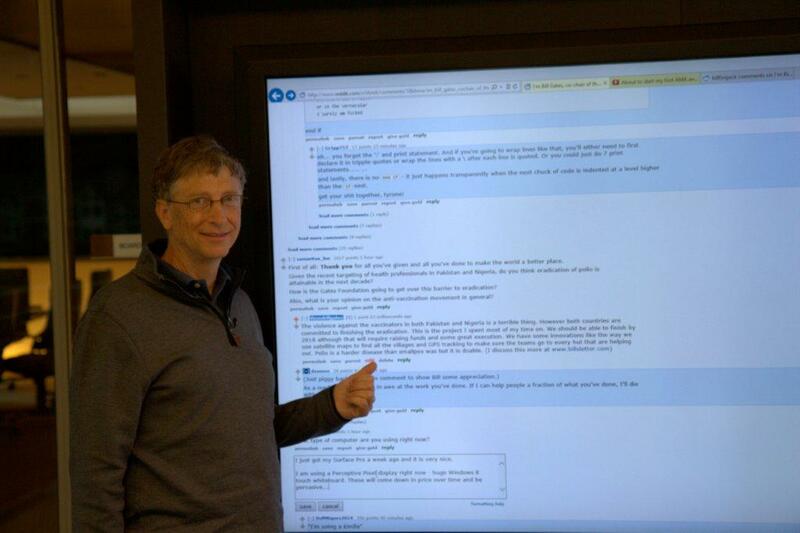 Bill Gates: I just got my Surface Pro a week ago and it is very nice. Bill Gates: Vista was what eventually shipped but Winfs had been dropped by then. Question: Can you still jump over chairs? Bill Gates: Seriously Bing is the better product at this point. Try the challenge. I am biased but the work to make Bing better has been amazing. Question: What emerging technology today do you think will cause another big stir for the average consumer in the same way that the home computer did years ago? Bill Gates: Robots, pervasive screens, speech interaction will all change the way we look at "computers". Once seeing, hearing, and reading (including handwriting) work very well you will interact in new ways.. Question: How was your relationship with Steve jobs? I always hoped that y'all were really good friends and competitors. Question: Which world-wide health cause are we perfectly capable of easily solving and on the cusp of achieving but just need to put it over the top with a little more attention or resources to actually solve? Question: What is something that needs to be changed in the world, but money wont help? Bill Gates: It would be nice if all governments were as rational as the Nordic governments - reaching compromise and providing services broadly. The Economist had a nice special section on this last week. Africa governments have often been weak but you can't write a check to change that. Fortunately the average quality is going up. Mo Ibrahim tracks this in a great way. Question: First of all, thanks Mr. Gates for doing this. I’ve been a fan of you since I was a little kid, taking solace in your success as a professional nerd and philanthropist. If Microsoft didn’t take off, what would you have done and be doing instead? You are a leader in the ultra-wealthy philanthropists, but what do you think that people of median income can do to help improve the world the most? Bill Gates: If the microprocessor had NOT come along I am not sure what I would have done. Maybe medicine or theoretical math but it is hard to say. Most giving is done by the middle class so it is the backbone of generosity particularly in the United States. A key thing is to support government aid which is only 1% of the budget but helps poor countries in incredible ways. Question: I just wanted to say thanks for responding to my letter that I wrote to you in the second grade. I still have your autograph. Out of all the celebrities that were written to in my class you were the only to to respond. Thanks for making me the coolest second grader for a little while. 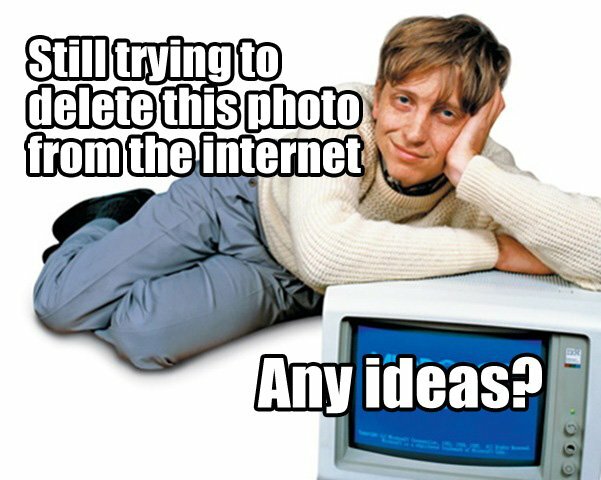 Bill Gates: I am glad you kept it! Question: How do you measure the success of the foundation? How does the foundation differ from other large philanthropic organizations? Thanks for all that you and Melinda have done and continue to do! Bill Gates: Our goals are focused on helping the poorest (globally) and improving education (in the US). We spend half of our money on global health. One metric to look at is reducing the number of children (under 5) who die. My annual letter talks about the amazing progress that has been made on this. Amazingly as health improves families choose to have less kids so paradoxically population growth goes DOWN as you improve health helping with almost every issue - from stability to the environment.. The Rosling video I posted on Sunday talks about this. Question: What is the greatest achievement of the Bill & Melinda Gates Foundation in your opinion and how do you choose which causes to support? Bill Gates: So far our biggest impact has been getting vaccines for things like diarrhea and pneumonia out which has saved millions of lives. Polio will be a great achievement along with key partners when that gets done. Question: Is Weezer still your favorite band? The anti-vaccine movement does not only exist in developing countries, such as Pakistan, but is quite popular here in the United States as well. As a result, the number of flu and whooping cough cases are bigger than ever. Are you planning on working domestically as well? edit for related question: Which countries do you think serve as models for their initiatives towards an overall healthier society? ie. who's doing the best? Question: Hi Bill, I have a few questions for you: 1) I'm from India. What do you think are some of the biggest challenges India currently faces that's hindering its progress? 2) At what point did you decide that it was time to retire and put the Microsoft part of your life behind you and focus completely on philanthropy? 3) Lastly, have you been involved at all with Microsoft after your retirement? Maybe helped them out a bit? P.S. I've been a huge fan of you since I was a kid. Maybe I'll get a chance to meet you one day! Question: What do you do for fun? I find it hard to fathom how someone like you can just disconnect. Disconnect from the emails, calls ,the media. All of it. What would be your definition of a chill and fun day? Bill Gates: I love playing tennis. I am an avid bridge player (a card game if you have not heard of it - it was more popular in the past!). I like to tour interesting things with my kids like power plants, garbage dumps, the Large Hadron Collider, Antarctica, missile Silos (Arizona),... I read a lot and watch courses (online or the Learning Company)..
Bill Gates: Hopefully we won't have terrorists using nuclear weapons or biological weapons. We should make sure that stays hard. I am disappointed more isn't being done to reduce carbon emissions. Governments need to spend more on basic energy R&D to make sure we get cheap non-CO2 emitting sources as soon as possible. Overall I am pretty optimistic. Things are a lot better than they were 200 years ago.. Question: How did you feel about your portrayal in Pirates of Silicon Valley, and who do you want to play you next in a movie? Question: Hi Bill, I am just wondering what your thoughts are on Windows 8. Do you think in general it has failed? I am not saying it has, but there are people saying it is not good, and I wanted to hear your thoughts on it. Bill Gates: It is a huge advance for Windows which people will see even more as the great applications and hardware come out.. Question: Anything left on your bucket list? Question: Did you ever own a Macintosh? Bill Gates: Microsoft does a lot of software for the Mac. I mostly use Windows machines but from time to time I have tried all of Apple products. Question: Windows 7 or Windows 8? Be honest Bill. Bill Gates: Higher is better. Question: What is your view on the world's reliance on crude oil, and will you be investing into researching other sources of energy? Bill Gates: I did a TED talk about the climate crisis. Over time we have to dramatically reduce CO2 emissions so using fossil fuels will require us to do carbon capture and sequestration. There has been far too little work on this. Question: Mr. Gates I was happy to see you last year at the Math Strategy Group at Sunnylands. My question is how do you see technology enhancing Mathematics education without actually replacing it? Bill Gates: The ability to test your knowledge and get refreshed on a topic you are making mistakes on will personalize a lot of the learning experience. People like Sal Khan are out in front figuring out how to do this well. My foundation has funded a lot of MOOCs focused on community college kids or kids who have to take remedial math. I am optimistic these will make a big difference.